Capacity Blockchain Solutions announces its first event! 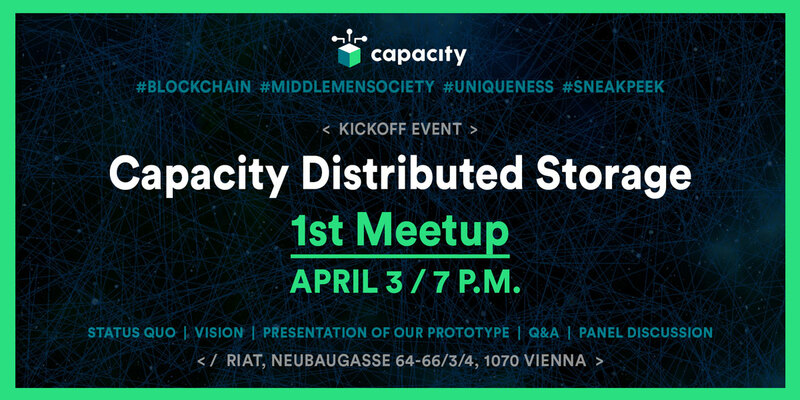 Capacity Blockchain Solutions will be giving an introduction to Distributed Storage – and demoing a preview of its solution. Learn about our recent cutting-edge software developments that aim to revolutionize the guaranteed availability of data for the coming decades! The popularity of cloud storage-based services has increased rapidly in recent years. Most people are aware of their major drawbacks. Among SPOF (Single Point of Failure) affecting the availability of data, there is also the issue of privacy. Centralized companies that operate as middlemen between the user and their content have control over their data, including the ability to access them. Any user is exposed to these risks. Capacity has developed software and a set of smart contracts that provide peer-to-peer data persistence and enough network intelligence to operate without any middlemen. Our network provides guaranteed availability of data over a predefined time period in a fully decentralized manner independent of the original source. None of the existing blockchain-based storage projects are able to solve this, a guaranteed availability of data suited for supply chain metadata, certificates and time-stamped documents. Secure and redundant storage of critical files that are replicated across a distributed network. The availability is reliably secured by the use of blockchain technology and an incentive-based system creating an open storage marketplace leading to reduced operational expenses (OPEX). Join Us at our first meetup!